Priced: $77.40 - $129.00 Rated: - 5 stars out of 5 by 33 reviews. "The Patagonia R1 Pullover is legit. It's light, comfortable, and still provides good warmth. I use it as a layering piece for the slopes, and also when I need a long sleeve on the golf course, or walking town if there's still just a little chill in the air. I sport the Narwhal Grey, but if you like a little pop there are some serious color options. Be cool, pull it over your head." 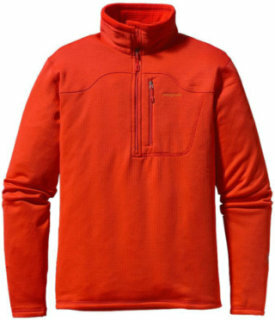 "The Patagonia R1 Pullover is a staple in my fall and winter layering system. My R1 not only keeps me super warm, it also looks great when I'm off to the bar or some winter camping." FEATURES of the Patagonia Men's R1 Pullover. SPECIFICATIONS of the Patagonia Men's R1 Pullover. Patagonia R1 Pullover - Men's: Made with Regulator grid fleece, the R1 Pullover is lightweight, warm, compressible, highly breathable and moisture-wicking - the perfect baselayer or midlayer for high-output activities in cold mountain environments. Sunrise to sundown, from epic approaches to alpine traverses, the versatile R1 Pullover stretches, breathes, moves moisture and insulates. And it is the best it has ever been: Patagonia collaborated with Polartec to fine-tune the high/low interior grid polyester fabric (Polartec Power Dry) into an exclusive that's more breathable and compressible and has an improved feel and increased durability, while still maintaining its warmth. Sized to accommodate light underlayers, it works as a stand-alone top or as a light midlayer. With a smooth, microfiber face for easy layering, offset shoulder seams for pack-wearing comfort and a zippered chest pocket. Recycled polyester R1 fabric provides excellent stretch, warmth, wicking and breathability in a variety of temperatures. Fleece has high/low grid on inside for enhanced compressibility, airflow and decreased dry time. Microfiber face speeds moisture wicking and allows for easy layering. Off-the-shoulder seam construction reduces bulk while wearing a backpack. Pockets: One zippered, brushed polyester mesh chest pocket. 6.8-oz Polartec Power Dry 93% polyester (41% recycled)/7% spandex. Patagonia recycles used soda bottles, unusable second quality fabrics and worn out garments into polyester fibers to produce many of Patagonia’s clothes. The classic R1® Pullover - minimalist design for maximum versatility - is the ideal midlayer for the full spectrum of mountain endeavors. Made with Regulator® grid fleece for outstanding stretch, breathability, compressibility and durability. From sunrise to sundown, from epic approaches to alpine traverses, the versatile R1® Pullover stretches, breathes, moves moisture and insulates. The finely tuned high/low interior grid polyester fabric (Polartec® Power Dry®) squashes down to practically nothing, has a terrific feel and remains durable and warm. The improved, technical fit accommodates light underlayers or works as a stand-alone top. Our new Variable Conditions Cuffs have discreet on-seam thumb loops and a spiral stitch construction that lets you push up the sleeves without constricting your forearms. New minimalist zippers reduce bulk, while lightweight micro-grid stretch polyester at the cuffs and armpits enhance breathability and dry times. A soft, kissing-welt zipper garage at the chin gives next-to-skin comfort. With a smooth, microfiber face for easy layering, offset shoulder seams for pack-wearing comfort and a zippered chest pocket. Our classic R1® fleece - with it’s high/low grid pattern for enhanced wicking, airflow and fast dry times - provides excellent stretch, warmth, and durability in a variety of temperatures. A lighter weight, micro-grid fabric on inner collar, underarm gusset, and Variable Conditions Cuff, improves breathability and dry times where you need it most. A re-engineered pattern offers a refined technical fit; offset seams provide comfort under outerwear and packs. Center-front Slim-Zip with soft, kissing-welt zipper garage and chin flap for next-to-skin comfort. Variable Conditions Cuff has discreet, on-seam thumb loops for added coverage, and a spiral stitch construction allows sleeves to push up easily without constricting forearms. One left chest pocket has Slim Zip install and clean finished zipper garage. Fabric: 6.8-oz Polartec® Power Dry® 93% polyester (41% recycled)/7% spandex. Weight: 333 g (11.75 oz). The Patagonia R1 Pullover is the perfect midlayer or baselayer for all of your alpine adventures. The R1 Pullover by Patagonia is the one you will grab up first for all your alpine adventures. This fantastic pullover is constructed from the very versatile R1® fleece, which gives you exceptional stretch and warmth while being completely breathable and wicking moisture. You also have a center from slim zip with super soft chin flap for extra close comfort, raglan sleeve construction that will reduce bulk when you are carrying a pack. Overall, this pullover is the best companion you could have on your next adventure. A versatile top in cool weather or serious base-layer for extreme cold weather endeavors in demanding conditions, the Patagonia Men’s R1 Pullover is made from Patagonia’s Regulator grid fleece and delivers outstanding stretch, breathability and durability. The R1Pullover manages moisture and insulates due to the high-to-low interior grid polyester fabric, made from Polartec Power Dry, and is breathable and compressible while maintaining durability and warmth. The Patagonia R1 Pullover for Men is finely tuned to stretch and breathe with its interior grid polyester fabric (Polartec Power-Dry) while remaining warm for any activity. Updates to the pullover include the new fit which accommodates for layering and additional Variable Conditions Cuffs with discreet on-seam thumb loops and a spiral stitch construction that allows pushing up the sleeves without constricting your forearms. Additionally, the new minimalist zippers reduce the amount of bulk, and the micro-grid stretch polyester cuffs and armpits allow breathability. Zippered chest pocket detail, a zipper garage at the chin for soft comfort, and shoulder seams that offer comfort for pack-wearing. The R1 Pullover from Patagonia offers maximum versatility in a minimalist-centered design. Featuring Patagonia's patented R1 fleece, the high/low grid patterning allows for excellent wicking and airflow, resulting in a dryer you. The solid color design makes the R1 Pullover perfect for meandering around town, while the Polartec Power Dry polyester and spandex blend let the R1 Pullover play well with layers. Technical proficiency merges with simplicity: A beautiful line, your climbing partner, a rope and a rack. Start at the bottom and climb to the top. Our R1® Pullover maintains the same alpine-style elegance. Its finely tuned high/low interior grid polyester fabric (Polartec® Power Dry®) stretches, breathes, moves moisture and insulates. It squashes down to practically nothing, has a terrific feel and its technical fit accommodates light underlayers or works as a stand-alone top. Our Variable Conditions Cuffs have discreet on-seam thumb loops and a spiral-stitch construction that lets you push up the sleeves without constricting your forearms. Minimalist zippers reduce bulk, while lightweight micro-grid stretch polyester at the cuffs and armpits enhance breathability and dry times. A soft, kissing-welt zipper garage at the chin gives next-to-skin comfort. With a smooth, microfiber face for easy layering, offset shoulder seams for pack-wearing comfort and a zippered chest pocket. Patagonia's R1 Pullover is engineered to perform in a wide variety of high output conditions. I've owned an R1 for a couple of weeks now and it is easily the best layering technical fleece I have ever owned. I wear it as a second layer atop a capilene silkweight shirt. I've used it to climb in in the gym, to play Ultimate frisbee and to wear around the house while doing work. When I go out on the town, I layer it underneath a flannel shirt. The collar tucks down so that you don't even know it is there. The longer sleeves do stick out a bit and I have to tuck them back into the over shirt's sleeves every now and again. But I'm willing to do that because I appreciate the coverage and the thumb loops so very much when I'm riding my bike home afterwards. I've worn it basically ever day since purchasing it, and have only taken it off to wash it. I'm getting another so I can rotate the two. Winter's cold won't be bothering me one bit this year. I love this lightweight fleece. Performs great in the winter with a base layer underneath, looks great around town (in casual settings, of course), and has held up remarkably well. I have 2 of these, and one is starting to show a little pilling in backpack strap areas. From reading other reviews it seemed that the fit on this was snug (fitted), so I purchased a large. Perfect fit for me: not too bulky but with room for a base layer and perfect sleeve length. I'm 6'1", 170lbs, wingspan of 6'1". The biggest con is the price. I really like this fleece, but it's hard to imagine paying full price for it. I got the R1 after hearing people rave about how great they were. The material is very impressive- soft, durable face, dries crazy fast, very breathable, and relatively warm. The fit was were my picky self ran into a few problems. I like the slim fit, and agree that, as a technical midlayer, it should fit close to the body. However, the underarms are a bit annoying. They provide for good reaching ability, but make my shirts bunch up in the armpits. Not a huge deal, but it does get pretty annoying when I am just wearing it as a casual piece. Other than that, a great jacket. I bought this pullover for my boyfriend who can never shop for himself! The blue was just too pretty to pass up. Even though he's only about 5'8", with broad shoulders, he's almost always a Large. But in this, the Large was just a little too big for him. Too long, and a bit too much material through the shoulders. He decided to keep it though, and after a few washes and wearings, it's just about perfect. Great as a base layer for winter activities, and really cute as a pullover for day wear! I have been using an R1 consistently since 2008 and it will always be my go to piece on all adventures. It is light and comfortable enough to wear around the house yet functional enough to include as a key layer backpacking and mountaineering. I love the fit. I am 6'1" 185 and always in between medium and large. The medium has long enough sleeves and torso length. I have put mine through a lot and will be replacing it with another R1 soon. It may be more technical than prior versions, but it is still well suited for use around town. I would go up a size if you plan on wearing a t-shirt or button up shirt underneath. I'm 6foot tall and 180lbs. The extra large is my size not too tight or baggy. The thumb loops are barely noticeable. The lighter fleece under the armpits and on the wrists is a nice touch. I reach for it all the time. I would highly recommend it. Fits chest and shoulders well but could be more tailored in the mid section. If you're slim and fit it will fit nicely in the arms/chest/shoulders but be a bit baggier than ideal in the stomach. Very comfortable though. I had another R1 a few years ago and I think I liked that one a bit better, the zipper didn't go as low and it seemed a little lighter. I really like Patagonia, a lot. The craftsmanship is great, materials and stitching hold up well for clothing that gets used in all conditions. The R1 is a great pull-over fleece. I wear it out on the town, and as a layer for hiking, snowboarding, and biking. I lost my black, and luckily found this on sale in blue. Great Color! The breast pocket is convenient for small items. I've owned my R1 for 10 years. It has seen some tough climates and has never failed me. It also looks the same as the day I bought it, wow! It's the perfect piece for layering or to wear around your city/town. I love to bring mine on an airplane and tie it around my waist when I travel. It's probably my favorite Patagonia piece I own. This fleece is the most versatile layer that I own. It works great in a layering system or as a primary layer. It has a great warmth-to-weight ratio and is very durable. I have taken it on several backpacking and camping trips, and it still looks good enough to wear around town. For me, a case of fixing something that isn't broken. The new version R1 has been re-conceived as tighter and trimmer -- and seems now to be designed primarily for layering...complete with finger-loops at the cuffs to keep sleeves from creeping when putting on outer garment. I'm sure this is a big improvement for those with a more technical bent, but I much prefer the old version which I used as my reliable go-to for casual work or hanging out. Perhaps in the future two versions? Does anyone actually like thumb holes? What is the deal with these silly things? The chest fits fine but the arms are way too tight and they bunch up around my elbows making my arms feel extremely uncomfortable while at work. The thumb holes seem really useless and cause so much discomfort in the sleeves. I'm all for slim, anatomical gear - but the new stuff is just too tight and too fitted (and basically just doesn't fit well). I'm 6' / 185: the large was huge and the medium was way too tight in the chest and pits. If it happens to fit you, I'm sure it functions well - but it just looks ridiculous. The stuff from two years ago functioned great, but you could also wear it our for a beer without looking like a complete tool. I agree that the sudden proliferation of thumb loops was a bad idea and is totally unnecessary. I can't remember ever reflecting on a piece of clothing and thinking "man, this thing would be great if only it had some thumb loops". I agree with most of the two major complaints. The fit is a tweener that forces you up if you intend to wear the garment as an outer layer, but is too tight in your regular size to be and look good. The thumb loops are a waste of cloth, unneeded. The pocket is good. The fabric is very good. But, I will wait to replace my aging inventory until you retro the garment.